Idaho Northern & Pacific #4510 rolls a lengthy train eastward between La Grande and Imbler. John Henderson photograph, Jeff Moore collection. In 1987, Union Pacific decided to divest itself of 87 branchlines and secondary mainlines, resulting in one of the great shortline creation booms in recent years. UP typically assembled branchlines that could be sold and operated together into package deals during these efforts; one of the largest of these was the "Boise Group", consisting of 476 miles of branchlines in southwestern Idaho and southeastern Oregon. The Intermountain Western Railroad initially inked a deal with UP to purchase this package; however, that deal fell apart before it could be completed. UP deferred any further action on the "Boise Group" branchlines until 1992, when the company modified the package to exclude some marginal lines and to focus the sale around lines largely dependent on timber industry giant Boise Cascade. 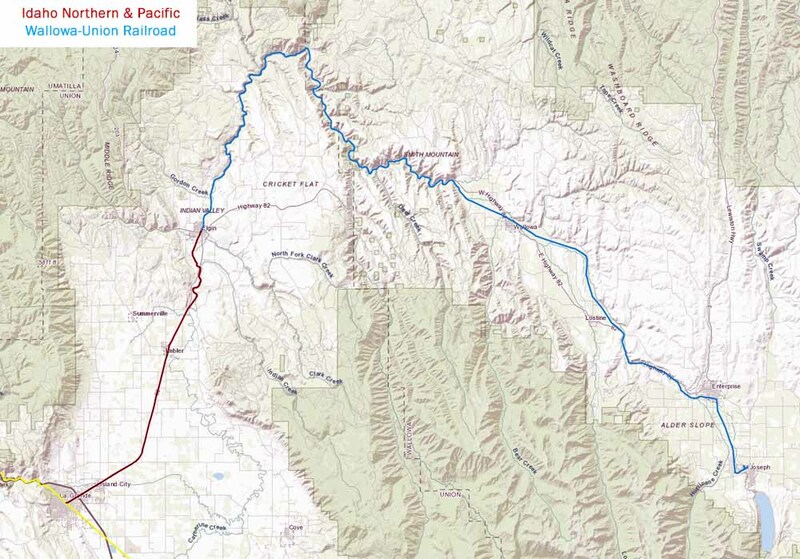 The revised package included only lines in Idaho save for the inclusion of the Joseph Branch, extending from La Grande to Joseph in northeastern Oregon. UP included the Joseph Branch in the package largely because it depended on three Boise-Cascade plants for most of its traffic. 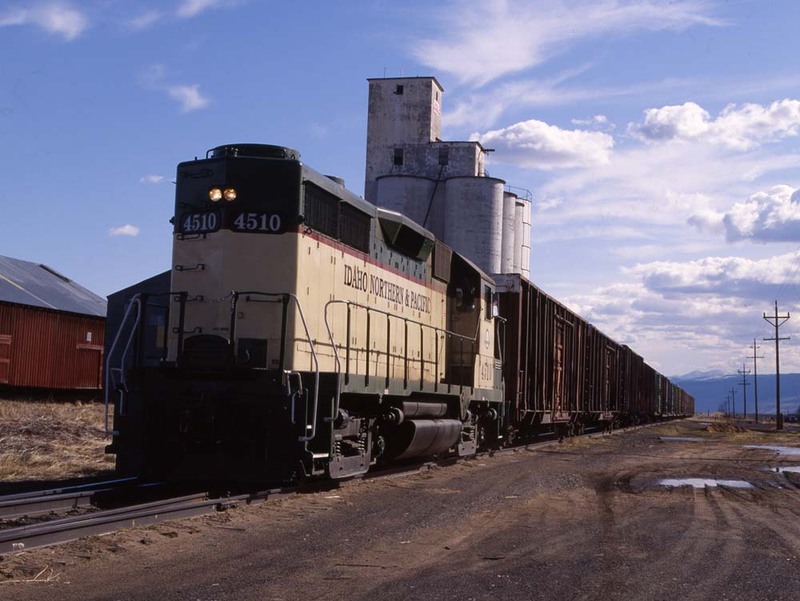 The Rio Grande Pacific Corporation, a Texas-based company that already owned other shortlines, placed the successful bid for the package, and on 14 November 1993 the new Idaho Northern & Pacific started operations. Under the final arrangements, the INPR leased the part of the Joseph Branch running from La Grande to Elgin and purchased the line beyond Elgin. 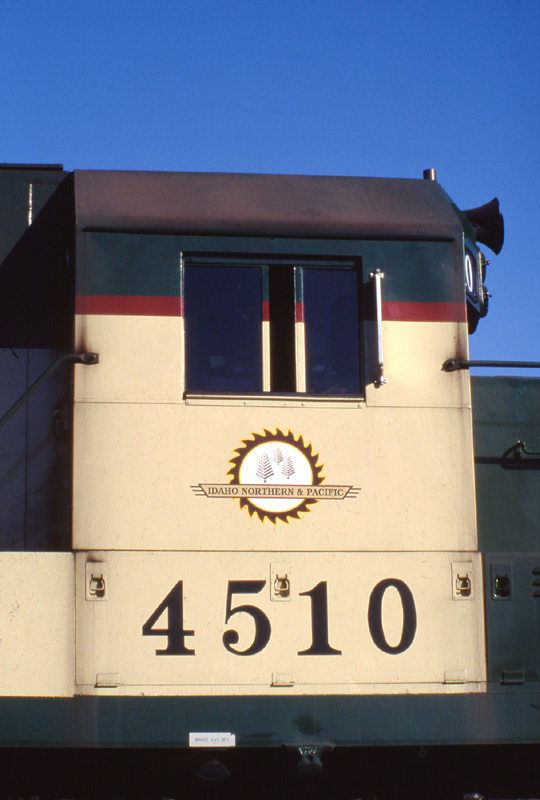 The Idaho Northern & Pacific logo on the cab of the #4510. John Henderson photograph, Jeff Moore collection. The Joseph Branch really started out as a side show to the rest of Idaho Northern & Pacific's primary operations in Idaho. The railroad cycled locomotives around its various properties, with typically four assigned to the Joseph Branch at any one time. INPR established Island City, two miles out of La Grande, as its base of operations. In addition to the three Boise-Cascade mills providing the bulk of the traffic, the railroad also served a number of other forest and agricultural related industries, mostly in the La Grande to Elgin section. INPR's operations over the Joseph Branch would remain healthy for less than a year. By the end of 1994 both of the large sawmills in Joseph, the largest shippers on the line beyond Elgin, closed down. INPR continued providing tri-weekly service on the line beyond Elgin to serve a small sawmill at Wallowa and grain shippers at Enterprise, but at the same time the company could see the handwriting on the wall. On 22 November 1994, the railroad filed for permission to abandon the 60.6 miles of track between Elgin and Joseph. Local governments and the State of Oregon fought back and stepped up their efforts to find new freight business for the line, but were not successful. INPR operations beyond Elgin continued until 26 March 1996, when a wet storm triggered a number of slides and washouts that the traffic levels the line generated simply did not justify repairing. The cessation of rail service beyond Elgin only intensified the legal battle over the future of that line. The trackage traversed some very scenic country, especially through the Grande Ronde and Wallowa river canyons. Many local businessmen, politicians, and organizations had long wished to operated tourist trains on the line above Elgin; however, such an operation would almost certainly need some form of freight traffic in order to remain viable, and after operations beyond Elgin ceased those efforts ran into trouble, as even if shippers could be found the line would still need to be repaired in order to serve them. The Surface Transportation Board approved abandonement of the line beyond Elgin on 3 March 1998. Despite having the authority to abandon the line, the INPR did not immediately move to start salvage work. The line remained in limbo while the various forces against the abandonment tried hard to save it. INPR finally ran out of patience and brought in a contractor to remove the line beyond Elgin in the summer of 2001; however, by that time, two of the smaller sawmills towards the end of the branch reopened, giving the line's supporters hope. INPR's salvage contractor ran into problems getting needed local permits to commence salvage work, and the delay gave the supporters the time they needed. 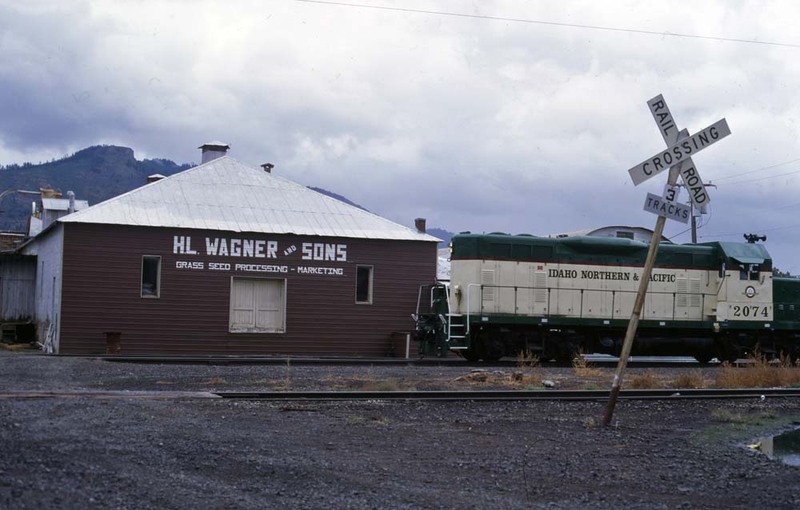 Wallowa and Union Counties together formed the Wallowa-Union Railroad Authority, and in May 2002 the new authority purchased the Elgin to Joseph trackage from INPR for $6.5 million. The sale also included two locomotives, three passenger coaches, a baggage and generator car, a flatcar, a snowplow, and some maintenance vehicles. INPR fully cooperated with the new authority, including repairing the line and operating it for the new owners through the first year. Traffic on the 21 miles between La Grande and remained healthy through all the developments on the line beyond Elgin. The Boise-Cascade plant at Elgin provided much of the traffic, supplemented by several other shippers scattered along the line. However, Boise-Cascade announced in May 2018 the Elgin plant would close within sixty days, which will restrict INPR operations to limited switching in the La Grande-Island City area and may threaten the condinued existence of the operation. INPR #2074 passing the H.L. Wagner and Sons seed facility in Imbler. John Henderson photograph, Jeff Moore collection. #1707- EMD/SCL GP-16, 1600 horsepower, c/n 11498, blt. 1950. Constructed as a GP-7, then rebuilt by Seaboard Coast Line to a GP-16. Built at Seaboard Air Line #1707; to Seaboard Coast Line #887; to Seaboard System #4607; to CSX Transportation #1707; to Minnesota Commercial Railway #1707; to Idaho Northern & Pacific #1707. #2074- EMD GP-7u, 1500 Horsepower, c/n 18893, built 1953. Constructed as a GP-7, the rebuilt by Atchison, Topeka & Santa Fe shops. Originally AT&SF #2876; to AT&SF #2074; to INPR #2074. #2094- EMD/ATSF GP-7u, 1500 horsepower, c/n 17000, blt. 1952. Constructed as a GP-7, the rebuilt by Atchison, Topeka & Santa Fe shops. Originally AT&SF #2773; to AT&SF #2094; to INPR #2094. #4606- EMD GP-9r, 1500 horsepower. Transferred to INPR from Nebraska Central Railroad in late 2012. #4608- EMD GP-9r, 1500 horsepower. Transferred to INPR from Nebraska Central Railroad in late 2012. #4606 and #4608 became the primary power used on this line after their arrival. #101, #102, #103- EMD GP-9s, 1500 Horsepower, c/n 21703, 22050, and 22562. All built 1956. Originally Chesapeake & Ohio #6066, #6142, and #6179; to Huron & Eastern #101-#103; to INPR #101-#103 1993. All retired 1994 and sold. #4500- EMD GP-40, 3000 Horsepower, c/n 32356, built 1966. Originally Atlantic Coast Line #921; to Seaboard Coast Line #1506; to Seaboard System #1506; to Seaboard System #6663; to CSX #6663; to INPR #4500. #4501- EMD GP-40, 3000 Horsepower, c/n 32361, built 1966. Originally Atlantic Coast Line #926; to Seaboard Coast Line #1511; to Seaboard System #1511; to Seaboard System #6668; to CSX #6668; to INPR #4501. #4507- EMD GP-35, 2500 Horsepower, c/n 29911, built 1965. Originally Southern Railroad #2656; to Norfolk Southern #2656; to Wheeling & Lake Erie #2656; to INPR #4507. Sold to Wallowa-Union Railroad #4507 2003; to Omnitrax. #4508- EMD GP-35, 2500 Horsepower, c/n 29912, built 1965. Originally Southern Railroad #2657; to Norfolk Southern #2657; to Wheeling & Lake Erie #2657; to INPR #4508. Sold to Wallowa-Union Railroad #4508 2003; to Omnitrax. #4509- EMD GP-35, 2500 Horsepower, c/n 29927, built 1965. Originally Southern Railroad #2672; to Norfolk Southern #2672; to Wheeling & Lake Erie #2672; to INPR #4509. #4510- EMD GP-35, 2500 Horsepower, c/n 29930, built 1965. Originally Southern Railroad #2675; to Norfolk Southern #2675; to Wheeling & Lake Erie #2675; to INPR #4510. MRL Leased Power- In addition to its own units outlined above, INPR also used at least four locomotives leased from Montana Rail Link on the Joseph Branch. In late 1994/early 1995 MRL #111 amd #114 were operating on the line, while #105 and #106 also spent time on the line. "Shortlines of the Pacific Northwest" by Jim Shaw, Four Ways West Publications, La Miranda, CA, 2011. "American Shortline Railway Guide, 5th Edition" by Edward A. Lewis, Kalmbach Publishing, Waukesha, WI, 1996. "Idaho Northern & Pacific, Boise Cascade's Timber Conveyor" by Wayne Monger, Feb. 1995 Pacific RailNews: pgs 42-49.